Dr. Shamim Ahmed Bhuiyan is an IT Architect, SOA solution designer, speaker and Big data evangelist. Independent consultant on BigData and HighLoad systems. Actively participates in development and designing high performance software for IT, telecommunication and banking industry. In-memory approaches can achieve blazing speed by putting the working set of the data into the system memory. When all data is kept in memory, the need to deal with issues arising from the use of traditional spinning disks disappears. This means, for instance, there is no need to maintain additional cache copies of data and manage synchronization between them. But there is also a downside to this approach because the data is in memory only, it will not survive if the whole cluster gets terminated. Therefore, this types of data stores are not considered persistence at all. In this blog post, I will do an effort to explore the Apache Ignite new native persistence feature and provide a clear, understandable picture how the Apache Ignite native persistence works. Permanent storage or media can be any distributed or local file system, SAN, NoSQL database or even RDBMS like Postgres or Oracle. Apache Ignite (since 1.5) provides an elegant way to connect persistence data stores such as RDBMS or NoSQL DB like Mongo DB or Cassandra. Most often persistence in an RDBMS will be bottlenecks and you never got a horizontal scaling in your system. For more information, I recommended you to have a look at the sample chapter of the book “High performance in-memory computing with Apache Ignite“. So, from the version 2.1.0, Apache Ignite provides ACID and SQL-compliant disk store that transparently integrates with Ignite’s durable memory as an optional disk layer storing data and indexes on SSD, Flash, 3D XPoint, and other types of non-volatile storages. 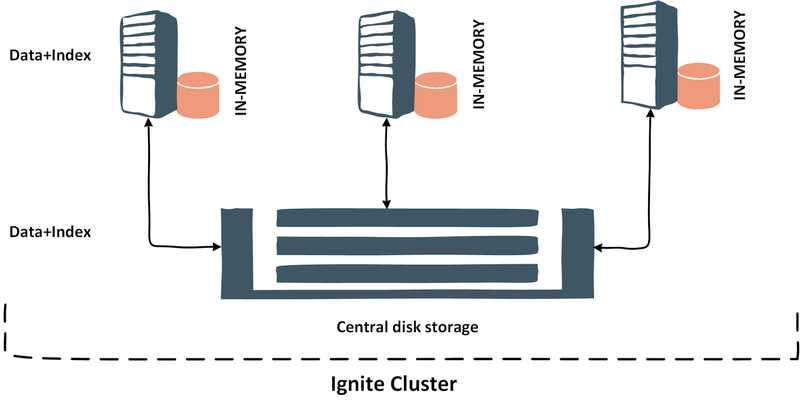 Data can be also stored in the central disk storage where all the Ignite nodes connected as shown below. Note that, to enable the Ignite native persistence, you only need to pass the following configuration (an instance of the PersistentStoreConfiguration), which already pre-configured in the example-persistent-store.XML file. 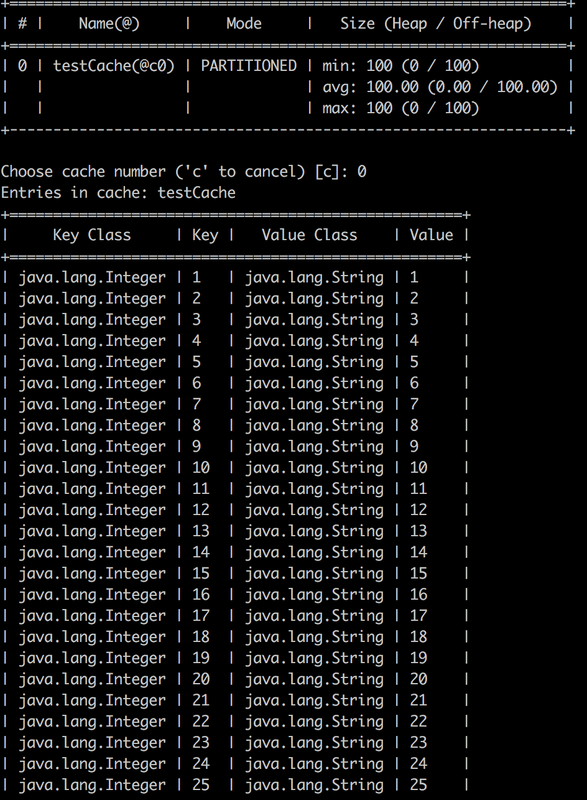 Step 2. create a Maven project with the following command. let’s use the ignitevisor command tool to examine the data. use cache -scan command in ignitevisor command tool. You should get the similar illustration in your console. All 100 elements in the cache. You should get something like in your console as shown below. Page are fixed-length block, it also supports automatic defragmentation. If you take a closer look at the pages size, all of them are 14 KB. Whenever Ignite needs to load data from the disk, it just loads the page file and so it’s very fast. documentation, which is quite exhaustive. ignitevisor. 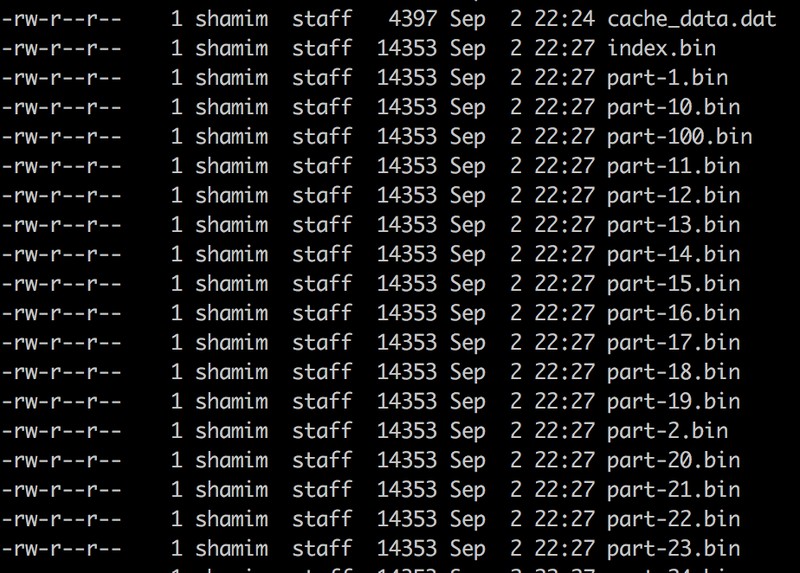 You will end up with a surprise that no data into the cache. Let’s slightly modify our helloworld class and run the application again, comment or delete the following fragments of the code as shown below. 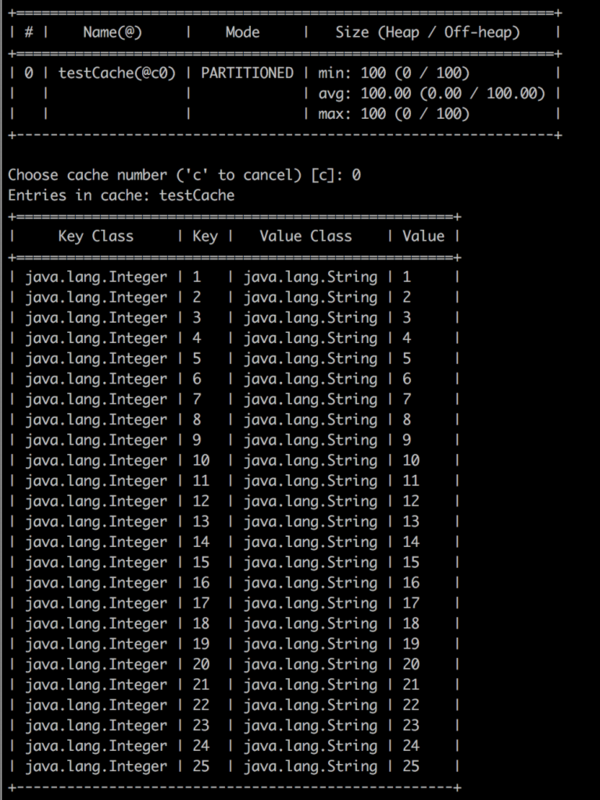 Run the application and check the cache testCache through ignitevisor and you application console. Whenever any read request occurs, Ignite first check the data into the memory. If the dataset doesn’t exist in memory, Ignite immediately load the cache entries from the disk and load into the memory. Also note that, all entries into the memory in offheap. With Ignite native persistence, now you can easily do backup for the data recovery, Denis Magda writes a comprehensive article for data recovery by using Ignite native persistence. One thing I have to mention here is the data replication between clusters. By using Ignite native persistence, now you can replicate data from one cluster to another on line. You can use any standard disk based data replication tools to copy the changed data set from the primary data center to the stand-in data center or Ignite cluster. Reference: The Apache Ignite Native persistence, a brief overview from our JCG partner Shamim Bhuiyan at the My workspace blog. hello sir,thank you for explaining this new Native Persistence Feature of Apache Ignite.It helps us to understand the overall working of Apache ignite native persistence.